I was a bit insulted. After all, I’ve been making apple pie ever since I was tall enough to reach the kitchen counter, and I’d like to think I’m pretty good at it. Over the years, I’ve tweaked it, finessed it, and let me tell you, my apple pie recipe is GOOD. I was not about to ask my mother-in-law, excellent cook and kind woman though she is, for her recipe. During my in-laws’ visit over Christmas, my mother-in-law recounted again the story of how she found this amazing recipe. About forty years ago, she was working with a woman who was a student at the University of Arizona. This woman was in possession of a recipe that had come from the culinary school there, and she shared it — with an admonition for Kay to keep it to herself. However, since it’s been forty years, and the recipe has been altered a bit, she willingly gave me permission to share. I made it for Christmas this year, my third or fourth attempt at this recipe over the years. The first time, I had followed my carefully-copied recipe exactly, not knowing of her adjustment — she made twice as much sour cream sauce as the original recipe called for — and it was a little bit of a disappointment. This time, more experienced, I made her adjustment and added one of my own, too, increasing the amount of apples by about 60%, doubling the sour cream filling as she had done, and adding cinnamon (which was, oddly, omitted from the original recipe) and nutmeg too, which I love but my father-in-law doesn’t. So the recipe I’m including here is quite similar to what you’d eat if my mother-in-law were making it, but different by several incarnations from the original recipe from the University of Arizona. Shreds and crumbs. Just awful. Now, on to the pie filling. The original recipe called for three cups of apples; I increased it to about 5 cups, which juuuust filled my large earthenware pan. You could do 6 cups and it would fit fine, but then you’d need to make a corresponding increase in sour cream and flour. Choose fairly tart apples; other than that recommendation, I just buy whatever is on sale. To make my life easier, I use a peeler/corer/slicer I found this summer. I peeled all my apples in under 5 minutes. Peeling, coring, and slicing all at once with just a few whirls of a handle. Next, make a mixture of 2 cups of sour cream, 1 1/2 cup of sugar, 2 teaspoons of cinnamon, 2 teaspoons of vanilla, a pinch of nutmeg, and 4 tablespoons of flour. As you can see in the photo below, a 2-cup measure isn’t the best tool for the job. That’s what we call a negative example. Get a bowl, for heaven’s sake. 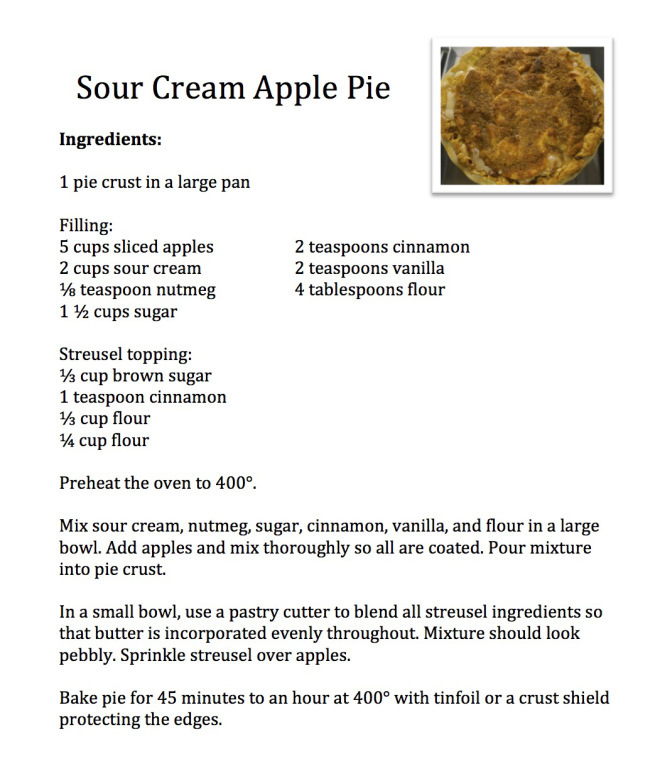 When it’s thoroughly mixed, add this deliciously creamy mixture to your apple slices, then pour it all into the crust. Mix sour cream, vanilla, flour, sugar, nutmeg, and cinnamon. Apples and sour cream in the crust. In a small bowl, make a streusel topping: Mix 1/3 cup of brown sugar, 1 teaspoon of cinnamon, and 1/4 cup of flour. Blend in 1/4 cup of firm butter until the butter is incorporated into the sugar and flour in evenly sized, pebbly chunks. I have the best success when I use a pastry cutter, but I know people who do it with a fork and never use a fancy tool for it. Sprinkle the topping onto the apple mixture in the pan, and you’re ready to bake. Use strips of tinfoil or a crust shield to keep the crust from becoming too brown during the long cooking time. The pie sometimes bubbles over, so to be safe, put it on a baking sheet or spread tinfoil underneath the pan. Bake the pie for 45 minutes to an hour at 400 degrees. Blend all the streusel ingredients. It should look pebbly, with all the butter pieces about the same size. A pie crust shield keeps the crust from burning during the long baking time. When it’s done, the whole pie will be bubbling, the top will be browned, and a fork or knife plunged into the middle will slide easily into tender apple slices. Let it cool a little before serving so the filling has a chance to set slightly. And there you have it. Best pie ever.